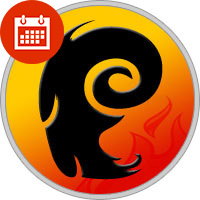 The Zodiacal Sign of Aries commences on March 21st, but for next seven days, it does not come into its full power. It starts loosing the power form May 14th. For seven days it is gradually losing its strength on account of becoming overlapped by the "cusp" of the incoming sign Taurus. Aries people are creative, adaptive, and insightful. They can also be strong-willed and spontaneous (sometimes to a fault). Aries people can be driven and are very ambitious often making them over-achievers in anything they set their mind to tackle. Aries are fire signs, and so too is their personality. They may be quick to anger, but don’t take it personally, it’s just their fiery, passionate personalities showing through. Aries signs have excellent sense of humor, and they get along with almost everyone at the party (and they DO know how to party). Aries can be impatient, but we love them anyway because they are devoted friends, lovers and family members - they are loyal to then end and will fight for their causes (usually supporting the underdog). In astrology, your Aries Zodiac sign (also called sun sign or star sign) is decided by the position of the sun at the moment of your birth, as seen from Earth. The sun takes a year to travel through the twelve Zodiac signs, but it’s not exactly a year of 365 days. The time it takes is closer to 365.25 days. That’s why we have leap years. The leap years make the dates of each Zodiac sign change slightly. Normally, Aries starts on March 21 and ends on April 20, but that’s just the mean. In reality it changes slightly in a four year period from one leap year to the next. If you were born on the 21st of March or the 20th of April, you have to check if you’re really an Aries or not. It never differs more than a day in each direction. The start of Aries must be within the 20th to 21st of March, and the end of it between the 20th and 21th of April. People born on other dates need not be concerned.